With hundreds of weddings happening in Delhi every month, on those key ‘marriage dates it’s hard to find a venue close to home or around the vicinity. If its Dilli ki shaadi hai, so the most obvious question is the venue Right? The venue sets the tone for what your wedding will be like. The most expensive line of item in your wedding planning spreadsheet and possibly the most impactful, choosing the right venue becomes paramount. We’ve picked some of the best wedding venues in Alipur to ease your find. Wedding venues can make or break your wedding, so take your pick wisely dear brides and grooms. We all know what Delhi weddings are made of and the high standards they hold. So, how about introducing you to the best of the lot on Alipur, from banquet halls to wedding lawns, resorts to farmhouses, you’re sure to find at least one or multiple choices for your big day. Let’s find the best banquet halls in Alipur.. Maple Garden, Alipur, Delhi, is the place you should go to if you are planning a wedding in the city. The hall and the lawn area can be utilised to host a grand wedding ceremony. The venue is situated near the famous Splash water park in Alipur and has hotels around the venue for accommodation purposes. Maple Garden, GT Karnal Road, offers a decor team who designs the venue exactly as you want it to look and a DJ who makes sure the party numbers played by them makes your guests groove. Maple Garden, Alipur, Delhi, also has a team of caterers on board who can treat your guests to a delectable wedding feast. The Jehan, Alipur, Delhi, has multiple banquet halls and lawn areas to host the wedding of your dreams. The Jehan Banquet, also boasts a beautiful terrace area suitable for parties if you wish to host parties under the beautiful blue sky. Located close to Just Chill Water & Fun Park and Guru Teg Bahadur Memorial, the chefs at The Jehan, G.T Karnal Road, Delhi make sure your guests are served with an array of delicious delicacies whereas their decor team decorates this venue to make it look stunning. Jehan, GT Karnal Road, is also suited for people who want a venue close to G.T Karnal Road. MH One Resort Hotel, Alipur, Delhi is a go-to destination for hosting the most lavish wedding functions. The venue serves flavoursome delicacies to choose from in both vegetarian and non-vegetarian food to their guests. The decor team at MH One Resort Hotel Delhi takes care of the decoration for your big day. The venue serves alcohol and also allows you to get it from outside to please your guests. MH1 GT Karnal Road offers complimentary changing rooms for the bride and the groom on their special day. Richmondd Lee Castle, Alipur, Delhi is one of the best wedding destinations in the city. 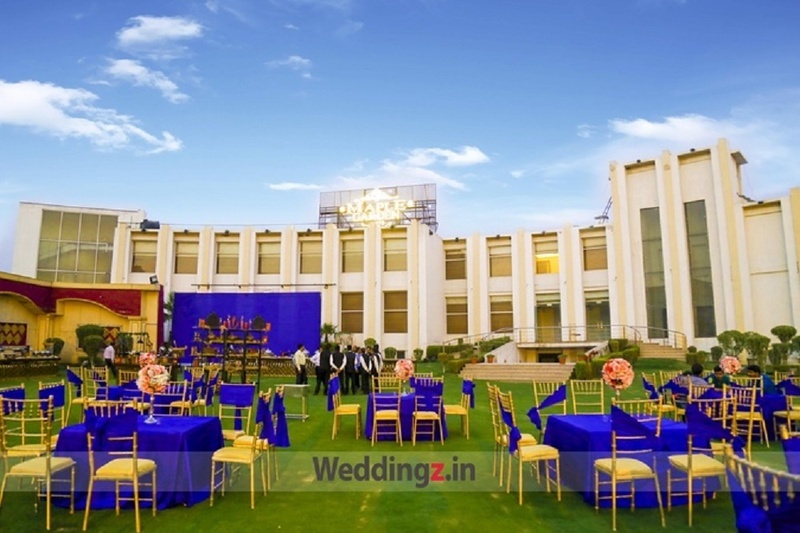 It has spacious lawn areas as well as banquet halls that can be utilized for hosting various pre-wedding functions like mehendi, haldi, sangeet and engagement. It is also ideal for hosting your wedding and reception ceremony also their party areas can accommodate a huge crowd for your function. Richmondd Lee Castle Delhi serves a wide range of tasty delicacies to choose from in both vegetarian and non-vegetarian food. Zeenat Motel & Resort, Alipur, Delhi is ideal if you wish to host your grand wedding in a lush green lawn and host other pre-wedding functions in a spacious banquet hall amidst much fanfare. Even though the venue has its caterers they allow you to bring your own catering team who understand your taste and choices. Zeenat GT Karnal Road serves delicious pure vegetarian food to their guests. The decor team takes care of the decoration for your big day allowing you to sit back to enjoy your function. Zeenat Resort Alipur serves alcohol and also allows you to get it from outside to entice your guests. The venue offers a complimentary changing room to the bride and offers ample car parking space for guests. If you're looking for a well-planned wedding affair, Mantram Hotel and Resorts, Alipur, Delhi is the venue you can go for. The venue provides you with the best of cuisines served by their team of caterers, who will even customize the menu as per your taste preferences and will make you crave for more! The decor team at Mantram Hotel And Resort Delhi takes care of the decoration for your big day. It serves alcohol to your guests and also allows you to get it from outside. Mantram Resort Delhi has multiple party areas which makes it ideal for having different functions at the same venue.